Well, now I’ve heard everything. Firestone Walker’s Rosalie is a new beer that is co-fermented with wine grapes from its native Paso Robles. Described as “the rose lover’s beer,” it smells like malt but looks like white zinfandel. The journey of Rosalie officially began last September, when nearby Castoro Winery harvested 200 tons of wine grapes for Firestone Walker, including 100 tons of Chardonnay and smaller lots of Viognier, Sauvignon Blanc, Riesling, Muscat Canelli and Orange Muscat. In the end, four separate R&D batches were brewed at Firestone Walker’s Propagator pilot brewhouse and the main brewery before the brewing team was ready to roll on the finished recipe, which includes hibiscus flowers in the whirlpool to create the beer’s brilliant rosé color. 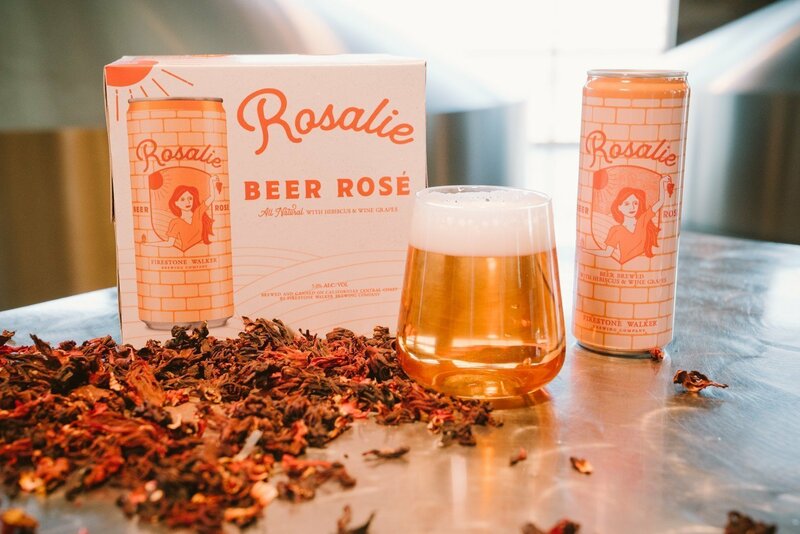 The result is Rosalie—a delicious one-of-a-kind beer rosé with bright fruit flavors and luscious acidity. The artwork of Rosalie honors the heritage of California as a winegrowing frontier, along with the brickwork of the historic Paso Robles Inn, a hometown landmark. It also evokes the classic scales of justice, depicting the beer’s balance of grape and grain. The artwork was hand-sketched and built out by the brewery’s in-house creative team. Oddly enough, all of those wine grapes mentioned above are white wine grapes, and they couldn’t be used to make rose wine (which requires red wine grapes, at least in part). It’s the inclusion of hibiscus in the mix that makes it pink. The wine grapes actually work to make this beer considerably sweeter than it would otherwise be. Firestone Walker doesn’t actually say much about the beer itself, which is really a straightforward pilsner with a restrained hop profile. Plenty of malt in the mix gives it an ample breakfast cereal kick at its core, but otherwise it’s reasonably simple. The wine grapes take over from there: This primarily becomes a chardonnay show, with notes of green apple and lemon peel overlaying the malt, though a somewhat sour edge arrives for the fruity, more wine-heavy finish. The hibiscus is an oddity here; while likely intended mainly as a coloring agent, it drops a perfumed bath bomb on the top of the (minimal) head that gives everything too much of a floral bent. I like the combination of beer and wine well enough — surprising myself, even — but could do without the spritz of potpourri.